The decade of the 60s hung in the air still, but only in the form of flotsam and jetsam. In the early 70s we kids didn't know what it all meant. Strange chemicals lay as chem trails in the cultural ether--Agent Orange, LSD, PCP, THC--and the ferrous-smelling molecules of recent assassinations, a heavy aerosol of blood droplets from RFK, MLK, Manson, and Kent State. Before Commercial News Network took over, the three old TV network ushered into our family rooms graphic scenes of the marching carnal house that was Viet Nam, as presidents LBJ and Nixon painted themselves into corners. Relief was at hand Saturday mornings when The Monkees took over. Playing in a slot sandwiched by cartoons, this program was a zany adventure featuring a wholesome boy band, whose driving force, apparently, was Davy Jones. The style of filming was inspired by the proto-music videos of Beatles zaniness. Jones and his Monkees, however, were not as testy as the original four, hardened as they were in habits from the underground years in salty districts of Germany and England. After interest in 60s psychedelia ebbed, team-player Jones parlayed his career into a successful second phase as a valuable character in Disney's Pirates of the Caribbean franchise. Disney's ride at Disney World featured a roller coaster passing through a world of automated skeletons, spawning a model-building craze for the macabre. Concurrently, the works of H.P.Lovecraft gained sway, offering a cosmology lead by the tentacled one, Lord Cthulhu, crypt-keeper of the cosmos. Medical technology offered Jones an unusual opportunity around the in the early 2000s when cyclosporine, a imminosuppressive drug derived from a Norwegian fungus, was discovered. This allowed Jones to have one of the first human-cephalapod partial facial transplants. He thrived with his new role and look, bringing a prehensile realism to his role in the Pirates movies. Despite his unorthodox look and physical state, his recent death appears to be natural. R, hilarious alloy again. 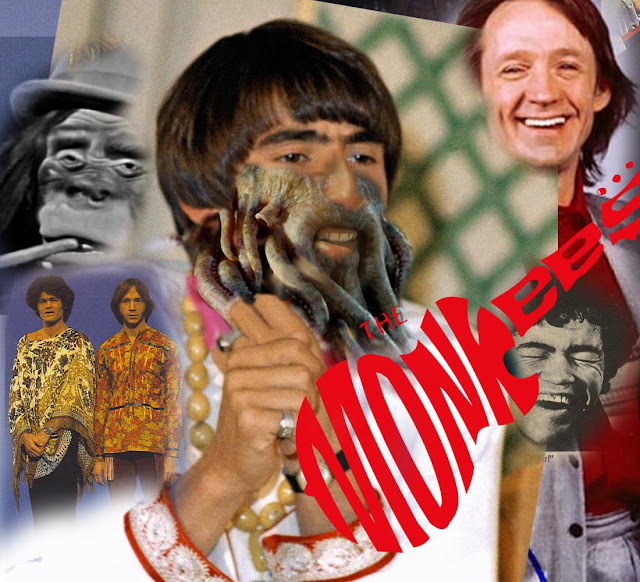 I watched the Monkees a bit when I was a kid... The only thing I remembered was being confused/ frightened by the intro, where one of the prefab four is being wheeled in a hospital bed, and the gunfighter's belt dropped, the slow mo stuff... The show had some surreal jump cuts, saw a few episodes recently. The movie called Head, featuring the Monkees and Victor Mature, is also worth a look.